When I first lost the weight, I had a mantra: if you don't like something, do something about it. And I surrounded myself with people who supported that, and who chose to live the same way. I decided recently that I was going to be taking charge in that way not only with my health, but with my professional life. My office mate and I share stories every day about our frustrations with some students, with administrative things. We commiserate about how we aren't compensated enough for how much is required of us here (we have a heavy teaching load because we aren't supposed to be required to do any University service, but then we are put on service committees anyway ... I make less here than I did in California, and I teach twice as many classes a year here, plus all the service). My first step was to apply for positions at places I would not only like to live, but where I could thrive. Places where the money is good, the course load is reasonable, and there will be job security. I have six or seven active applications right now, and have received my first rejection. I'm not in a position where I need a new job immediately, it's just that a new one would be nice. So the rejections aren't as difficult to swallow as they had been when I was looking for the job I have now. Next, I approached my department head, and asked why we didn't offer any sections of French in the summer. Spanish gets to, so why not French? And what a blessing it was to hear from him that it was only because the other instructors in the past hadn't wanted to teach in the summer. So I got two courses posted, and now my task is to ensure that they get filled. 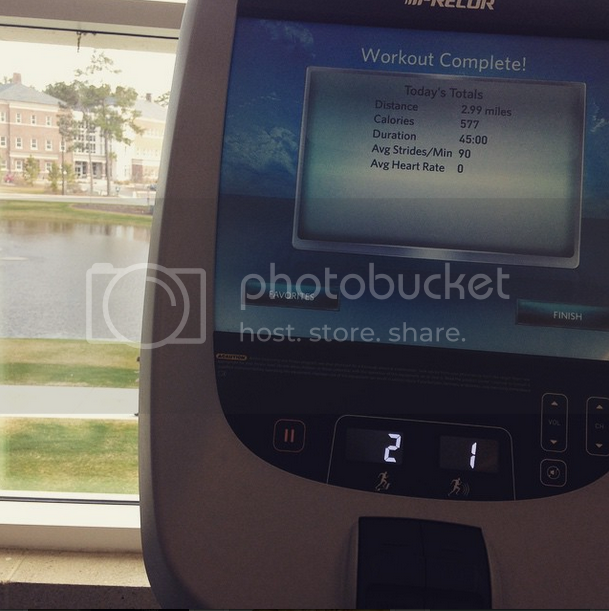 That is the office where I work/teach, as seen from one of my favorite cardio machines at the gym. Summer teaching guarantees that I'll be this close to the gym four times a week for almost the whole summer. I'm really optimistic that it will help keep my eyes on my goals when I would usually use summer break as an excuse to avoid workouts. I'm so glad to see you posting regularly again. You're my favorite blogger, hands down. I think it's really great that you're being proactive about your job. Yep... getting into a routine, no matter how small the change my be, a 5 minutes walk between classes or a 5 minute workout of a few toning exercises, is key to making changes for life. Crossing my fingers for you on receiving an acceptance letters from the other 6 institutions!!! I always took summer courses in college. I hope your classes get filled. It looks like your campus is beautiful with just that little view we have there. Are there other pluses to living/ working there (like no snow or cost of living) that compensate for the other issues? Good for you for going when it's so close. The apartment I live in has a mini workout room down the hall (which granted is a seriously looong hallway) but I still find excuses not to go. I was on a really good streak for a while, so I'm hoping I can kick it back into gear. that all sounds great, there;s nothing so satisfying as being proactive in your own life!